Abstract: A 10-metre object on a heliocentric orbit, now catalogued as 1991 VG, made a close approach to the Earth in 1991 December, and was discovered a month before perigee with the Spacewatch telescope at Kitt Peak. Its very Earth-like orbit and observations of rapid brightness fluctuations argued for it being an artificial body rather than an asteroid. None of the handful of man-made rocket bodies left in heliocentric orbits during the space age have purely gravitational orbits returning to the Earth at that time. In addition, the small perigee distance observed might be interpreted as an indicator of a controlled rather than a random encounter with the Earth, and thus it might be argued that 1991 VG is a candidate as an alien probe observed in the vicinity of our planet. The approach taken in this paper is to investigate the different probabilities regarding the nature of the near-earth pass of the object designated 1991 VG. Three distinct possibilities are apparent. The first is that it was a natural asteroid, to which we assign a probability P(n), that is, Probability natural. 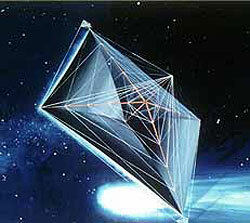 The second is that it was a man-made spacecraft, probability P(s), or Probability spacecraft. The third is that it was an alien artifact, probability P(a), Probability artifact. If we assume that there are no other possible explanations then the three taken together and written in formula P(n) + P(s) + P(a) = 1. The scepticism of a scientist (myself included) leads one to assume that P(a) = 0, but that assumption, it will be seen, is not supported by our knowledge of 1991 VG and its discovery circumstances. I show below that these indicate both P(n) and P(s) to be small, implying that P(a) , Probability artifact, is significant. Chapman-Rietschi 1 has noted, following Arkhipov2, that much work and discussion of SETI tends to overlook the possibility of discovering alien artifacts within the Solar System. Such a pursuit is normally known as SETA (Search for Extra-Terrestrial Artifacts3,4). Over the past two decades various authors have debated whether the best place to look for such artifacts is in the asteroid belt5, in the outer Solar System6 on planetary surfaces7, or as extraterrestrial probes in the inner Solar System8-10, whereas the famous Fermi Paradox argument is based upon the understanding that such probes have not been detected, and thus extraterrestrial intelligent beings do not exist11,12. The aim of this communication is to point out (very tentativeIy) that an extraterrestrial spaceprobe may have been detected in late 1991 in near-Earth space. The 0.91-m Spacewatch telescope of the University of Arizona commenced operation in 1989, since when it has been used to detect asteroids of an unprecedentedly small size in the Earth's vicinity13, On 1991 November 6 Spacewatch observer Jim Scotti discovered a body initially described as being a "fast-moving asteroidal object" at a geocentric distance of 0.022 AU, a month before its closest approach (at 0.0031 AU) to the Earth14. Its heliocentric orbital elements at discovery were a = 1.04AU, e = 0.065, i = 0°.39, so that the suggestion was soon made that "this might be a returning spacecraft" (ref. 14). The fly-by of the Earth-Moon system resulted in slight changes in its osculating elements15-17. Assuming the albedo of an S-type asteroid is appropriate its spectral reflectivity was not dissimilar to main-belt S-type asteroids13 it would be about 9 m in size, or 19 m with the albedo of a C-type. However, observations by Richard West and Olivier Hainaut from ESO, close to the time of nearest approach, indicated a non-asteroidal nature for the object, with strong, rapid brightness variations which can be interpreted as transient specular reflections from the surfaces of a rotating spacecraft18,19. Contrary to this, Wieslaw Wisniewski at Kitt Peak found only a slowly-varying brightness18 but under poor observing conditions. The question of the nature of this object might have been answered by radar observations, but radar sounding attempts failed16,20 1991 VG was also observed in 1992 April with larger telescopes at Kitt Peak21, but it is unlikely to be observed again soon (see below). However, that recovery allowed an improvement of the ephemeris (in both cartesian and frequency space) for the time of the radar observations, which may make identification of 1991 VG in those data possible when they are fully analyzed20. As outlined in the opening quote at the top of the page, the approach taken here is to investigate the different probabilities for the nature of this object, given our incomplete knowledge. Three distinct possibilities are considered apparent. The first is that it was a man-made spacecraft. The second is that it was a natural asteroid. 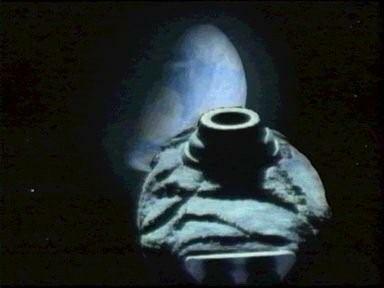 The third is that it was an alien artifact. First the probability that 1991 VG, was a returning spacecraft is considered. There have been few large rocket bodies released onto heliocentric orbits by homo Sapiens. A reported backwards integration, using only gravitational effects, indicated that 1991 VG came within 0.07 AU of the Earth-Moon svstem in 1975 February-March (ref. 16), and also into our vicinity sixteen years earlier in the late 1950s. Without detailed knowledge of the orbit in 1975-1991, and thus the actual approach distance, it is not possible to extrapolate the orbit back to that earlier approach to define the year, even if only gravitational forces are significant. According to the standard references22,23, there are few candidates. For the earlier period one can list Pioneer 1 (launched 1958 October), Pioneer 3 (1958 December), Luna 1 (1959 January), Pioneer 4 (1959 March), Luna 2 (1959 September), Luna 3 (1959 October), and Pioneer 5 (1960 March), but these are generalIy small objects (some of which are known to have re-entered the atmosphere, with Luna 2 having apparently hit the Moon), and all have launch dates later than the nominal extrapolation of 1991 VG back to the first half of 1958. In the mid-1970s, Luna 23 was launched in 1974 October but landed on the Moon, its launcher stages having soon re-entered the atmosphere; Helios 1 was put into a heliocentric orbit in 1974 December along with two associated rocket bodies fragments (1974-097C and 097D), and there were no other launches escaping the Earth until Venera 9 was sent to Venus in 1975 June. Identification with any of the above would require the action of non-gravitational forces, such as radiation pressure or leaking fuel18, but these agencies are not known to have acted; in any case, it does not seem to be possible definitely to identify 1991 VG as having originated on the Earth. The next step is to estimate the a priori probability that 1991 VG would be detected by Spacewatch. Having a very Earth-like orbit, at least prior to the late-1991 close approach, this object has an exceptionally high collision probability with our planet. In calculating the mean terrestrial impact probability for all 169 known Apollo and Aten asteroids (which has a value of 9.3 x 10-9 per year), I derived a value of 4.8 x 10-6 per year for 1991 VG alone, meaning that I would have quadrupled the mean terrestrial collision probability for the ensemble should I have included that object24. (Chyba25 calculated 4.2 x l0-6 per vear for 1991 VG, but by using elements that I would have expected to have given a result higher than my own, although he used a different technique.) Instead I decided to reject 1991 VG from the ranks of naturally-occurring objects and to suppose it to be man-made. The referee of my paper24 made the interesting  but tongue-in-cheekcomment in his report that "unless the author knows of observations that suggest that 1991 VG has human characteristics, I would suggest that the word 'anthropomorphic' should be replaced by 'artificial'." The insinuation does not need to be explained further to the reader in the context of this communication. The referee's comment was stimulated by my estimation of a low a priori probability that 1991 VG would pass close by our planet, using my collision probability cited above and an enhanced cross-section for passage within some stipulated miss distance of the Earth. A more complete value for the chance of detection can be estimated as below by evaluating (i) the probability of passage sufficiently close by the Earth for detection, and (ii) the probability of detection given that such a passage occurs. The pre-encounter inclination allowed a deviation by 1991 VG of only 0.0068 A U above or below the ecliptic, whereas it had apsides at heliocentric distances of 0.9715 and 1.1071 AU. To first order, then, one can assume that 1991 VG was constrained to an annulus in the ecliptic plane which was 0.1356 AU wide. The Earth would pass 1991 VG once every 16.75 years (from the difference in their orbital periods), and in each such passage there is a (0.044/0.1356) 0.3 probability of passing within the geocentric distance at which the object was discovered if one assumes that the heliocentric distance is random within that annulus, and neglects the fact that 1991 VG could not go 0.022 AU sunward of the Earth at perihelion. In reality any orbiting object spends more time close to its apsidal distances, but that is neglected here, as is gravitational focusing. Both these factors are included in the calculations in ref. 24, but are not of great significance since the aim is only to obtain a rough estimate of the probability of a near passage. From the above, the answer is about one in 50 per year, for passage within 0.02 AU, a value supported if one takes the impact probability quoted earlier, allows for gravitational focussing, and substitutes for the larger cross-section but with account being taken of the fact that the maximum distance above or below the ecliptic is 0.068 AU. For passage within the actual perigee distance the probability is considerably smaller, its estimation requiring account to be taken of the excursions of 1991 VG from the ecliptic: I found that such a passage would be expected about once every few thousand years24. There are many selection effects which govern the chance that the Spacewatch team (the only suitably-equipped and operational unit) might detect a ~10-m object passing near the Earth. The records of the past five years show that they have found about one such object per year whereas the flux at such a size is thought to be between a few and ten per day crossing cis-lunar space, although it could be higher26. The probability of detection could therefore be estimated as being ~1/1000. Such an estimate could be made by anyone without inside knowledge of the operations of Spacewatch, but Scotti points out that the probability is even lower than that27. In a night the Spacewatch telescope might be used to patrol four regions each of area 3.4 square degrees, giving a fractional celestial-sphere coverage of 4 x 3.4/41253 = 1/3033. Triple scans of each region are carried out, so that if the objects were moving fast enough to cross the region between scans, as many as 1/1000 of the detectable (bright enough) targets might be found, in agreement with the above crude estimate. Scotti, however, states27 that "1991 VG was a bit on the exceptional side." On the discovery night, for some reason he set the V magnitude detection limit lower than usual, and 1991 VG was picked up at V = 20.7, whereas 20.4 was the nominal threshold in use at that stage. Thus 1991 VG would have been missed by the detection software had Scotti not set the brightness limit so low. Whilst the object then brightened as the geo-centric distance decreased, we must note that (i) 1991 VG might not have appeared in the Spacewatch search regions as that brightening occurred; and (ii) even if it had been found later, without the discovery having already occurred, its reduced geocentric distance at identification would then decrement the frequency of approaches as determined above. For the actual discovery circumstances Scotti estimates the probability of detection, given the low threshold that he had set, as having been about 1/7500, but even that neglects trailing losses. That is the probability of detection on any particular night; one would have to multiply that figure by ~ 20 (to account for 1991 VG being within the detection distance limit for about 20 days), by ~ 0.6 (to account for the Spacewatch telescope being operated on only 18 nights per lunation), by ~ 0.7 (to account for observing time loss to weather), and by ~ 0.5 (for trailing losses). An overall figure of 1/2000 might therefore be appropriate. Given the estimates in the last two paragraphs (one close-enough passage every 50 years, one chance in 2000 of spotting it on each passage), the a priori probability of discovery for x991 VG was at most one in 100,000 per year. The intended meaning of that statement is that if the Spacewatch telescope were operated in the same way as it is at present, then just one in 100,000 objects like 1991 VG, would be discovered each year, whereas only a handful of man-made rocket bodies have been released onto heliocentric orbits in the plausible epochs. If 1991 VG is indeed a man-made rocket body, then its return to our vicinity and its accidental detection by Spacewatch was a very unlikely event, and thus one estimates that Ps is very small. Attention is now turned to Pn, the probability that 1991 VG was a natural body. There are two factors which argue against such an identification. The first is the light variations mentioned earlier; the balance of evidence (e.g,, see the image presented in ref. 19, which is distinctly similar to rotating artificial satellite trails frequently seen .in wide-field photographs) supports the idea that 1991 VG is an artificial object. Second, the pre-encounter orbit of 1991 VG was so similar to that of the Earth that it was unstable under close approaches to our planet on a time-scale measured in millennia at most. This is obvious from the above discussion of the frequency of close approaches. The dynamics therefore would require 1991 VG to have recently arrived in that orbit (perhaps as ejecta from a lunar impact? ), which is unlikely, if it is an asteroid. The Spacewatch team have suggested13, 26 that there is a population of small asteroids concentrated near the terrestrial orbit, but in general these have either eccentricity or inclination much larger than zero, and semi-major axes differing from unity, so that they are dissimilar from 1991 VG; this is obvious from the fact, as stated above, that the inclusion of 1991 VG in an estimation of the mean terrestrial impact probability quadruples the value obtained using all other asteroids (i.e., including this hypothesized near-Earth belt). One thus must estimate that Pn is small. Since both Ps and Pn are small, one is forced to conclude, in the absence of new information, that Pa is not zero and indeed seems to be substantial, meaning that 1991 VG is a candidate for consideration as having an alien genesis. Are there other data that contradict this (i.e., information that forces one to estimate a small value for Pa)? There are no accepted identifications of alien artifacts, but if the 1991 VG episode were characteristic of terrestrial visitations then would these have been spotted in the past? Spacewatch is the first such surveillance programme to patrol deep space, so the absence of similar episodes is not surprising. Ground-based military surveillance of near-Earth space relies upon optical sensors for ranges over 10,000 km, the radar detectibility limit being ~10-m at that range28,29; data from such programmes do not contradict the alien probe interpretation, especially since the flux of small asteroids is much higher and objects found to be in non-geocentric orbits are soon discarded. The final point to be discussed, on the basis of the alien artifact interpretation, is whether 1991 VG was under control, or making a random passage by the Earth (i.e., an inert artificial object). If the latter then one can estimate the population from the probability of discovery of ~0.00001 per annum, and the Spacewatch team having discovered one such object in five years of operation. Thus one would estimate ~20,000 as being the population in similar orbits (contra the Fermi Paradox), and thus about one per decade to hit the Earth or one per century to fall onto the populated regions of the globe. Observations (or the lack of them) do not preclude this possibility. On the other hand, continued searching with Spacewatch, and, one hopes, within a few years with the more powerful Spaceg,uard system30, would turn up other examples of such a substantial population. The non-detection of such a population would indicate that 1991 VG is unlikeIy to have been an inert alien probe. Conversely, only about one in 50 objects passing randomly within 0.022 AU have perigee heights as low as 0.0031 AU, as was observed in the case of 1991 VG, leading to the possibility that it was a singular alien spaceprobe on a controlled reconnaissance mission. This interpretation would not be limited by the probabilistic analysis given above, since the probe could have been directed to make repeated close passages. The above has been intended to provide prima facie evidence that 1991 VG is a candidate alien artifact. The alternative explanations that it was a peculiar asteroid, or a man-made body are both estimated to be unlikely, but require further investigation. In connection with the former, it will be of interest to see whether sky-surveillance programmes reveal asteroids with similar orbital and light-curve properties as 1991 VG. For the latter, each of the handful of rocket bodies which mankind has left in heliocentric orbits in the plausible launch windows requires detailed investigation' are their initial. heliocentric orbits known, was fuel left on board any of them, are their physical parameters such that non-gravitational forces could plausibly bring them back to the Earth within a few decades, could they fit the observed spectral reflectivity of 1991 VG? My personal bias is that 1991 VG was indeed an artificial object, but an anthropogenic one. The point is that such an interpretation, which will likely be favoured by most, requires: (i) the action of non-gravitational forces which are not known to have occurred; (ii) the chance return of one of a very small number of man-made objects left on heliocentric orbits in acceptable epochs; (iii) that return to have been unusually close, given its geocentric distance at discovery; and (iv) the object to have been spotted despite long odds against such discovery. If 1991 VG is a returned man-made rocket body, it was very much a fluke that it was observed, and the normal process of science then requires that we consider the possibility of some other origin for it. In February 1942, barely two months into World War II, in an event that became known as the 1942: THE GREAT LOS ANGELES AIR RAID, a giant airborne object of unknown origin overflew the Los Angeles basin causing an area wide panic and an entire blackout of southern California. The object, seen by thousands, was pounded by over 1400 rounds of coast defense guns for a several hour period, seemingly escaping unharmed by direct hits. In a letter or memo of communication sent by then U.S. President Franklin Delano Roosevelt to U.S. Army Chief of Staff General George C. Marshall, dated February 27, 1942, two days after the UFO over Los Angeles, FDR refers to "atomic secrets learned from study of celestial devices." On March 5, 1942, less than two weeks after the above message, Marshall sent another top-secret memo to the President regarding the air raid over Los Angeles stating "it was learned by Army G2 that Rear Admiral Anderson recovered an unidentified airplane off the coast of California with no bearing on conventional explanation. This Headquarters has come to the determination that the mystery airplanes are in fact not earthly and according to secret intelligence sources they are in all probability of interplanetary origin." All such talk would indicate --- at a very high level --- the potential existance of and possible recovery and retaining of alien artifacts as far back as the early 1940s. Copies of both memos can be found at THE BATTLE OF LOS ANGELES: 1942 UFO website. 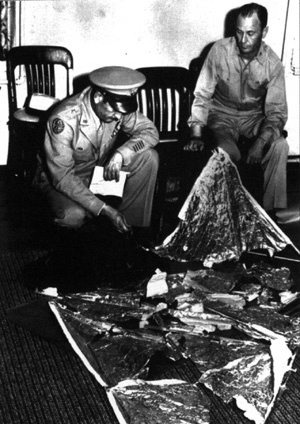 WHAT CAUSED THE UFO CRASH? FOIL SAIL MATERIAL, CIRCA 2005, U.S.
(1) P. A. L. Chapman-Rietschi, The Observatory,114, 174, 1994. (2) A. V. Arkhipov, The Observatory,113, 306, 1993. (3) R. A. Freitas, Jr., ]BIS, 36, 501, 1983. (4) R. A. Freitas, Jr., Spaceflight, 26, 438, 1984. (5) M.D. Papagiannis, QJRAS, 19, 277, 1978. (6) D. G. Stephenson, QJRAS, 20, 422, 1979. (7) M. J. Carlotto & M. C Stein, JBIS, 43, 209, 1990. (8) R. A. Freitas, Jr., JBIS, 36, 490, 1983. (9) R. A. Freitas, Jr., lcarus, 55, 337, 1983. (10) E. J. Betinis, JBIS, 31, 217, 1978. (11) F. J. Tipler, QJRAS, 21, 267, 1980. (I2) F. J. Tiplcr, QJRAS, 22, 279, 198I. (13) D. L. Rabinowitz et al., Nature, 363, 704, 1993. (17) Minor Planet Circ. 20823. (19) The Messenger (ESO), no. 66, 66, 1991. (20) S. J. Ostro, personal communication. (21) Minor Planet Cite. 20745. (22). G. King-Hele et al., The RAE Table of Earth Satellites, .3rd Edn. (Macrnillan, London), 1987. (23) Satellite Situation Report, NASA-Goddard Space Flight Center, 33, no. 4, 1993. (24) D. I. Steel, MNRAS, in press. (25) C. F. Chyba, Nature, 363, 701, 1993. (26) D. L. Rabinowitz, lcarus, 111, 364, 1994. (27) J. V. Scotti, personal communication. (28) N. L. Johnson & D. S. McKnight, Artificial Space Debris, (Orbit Book Co., Malabar. F!orida), 1987. (29) S. H. Knowles, Orbital Debris: Technical Issues and Future Directions, NASA CP-10077. 1992, p. 235. (30) D. Morrison (ed. ), The Spaceguard Survey: Report of the NASA Near-Earth-Object Detection Workshop (Jet Propulsion Laboratory, Pasadena, California), 1992.